CAR-T cell therapy offers a promising breakthrough for the future of cancer treatment for patients at Baylor Scott & White Health. The future of cancer care has more hope than ever before due to the promise of research in immunotherapy, which can allow a patient’s own immune system to help fight the disease. Baylor Scott & White Research Institute investigators are currently conducting clinical trials to test CAR-T therapies as well as other exciting immunotherapy applications. This important research has led to game-changing treatments that physicians on the medical staff at Baylor University Medical Center, part of Baylor Scott & White Health, are using to improve the lives of cancer patients across Texas. Baylor Charles A. Sammons Cancer Center at Dallas is the first center in North Texas to offer the first FDA approved CAR-T therapy for the treatment of adult patients with relapsed or refractory large B-cell lymphoma (DLBCL), a type of non-Hodgkin’s lymphoma. DLBCL is the most common and aggressive form of lymphoma and accounts for 25 to 30 percent of non-Hodgkin’s lymphoma cases in the United States. 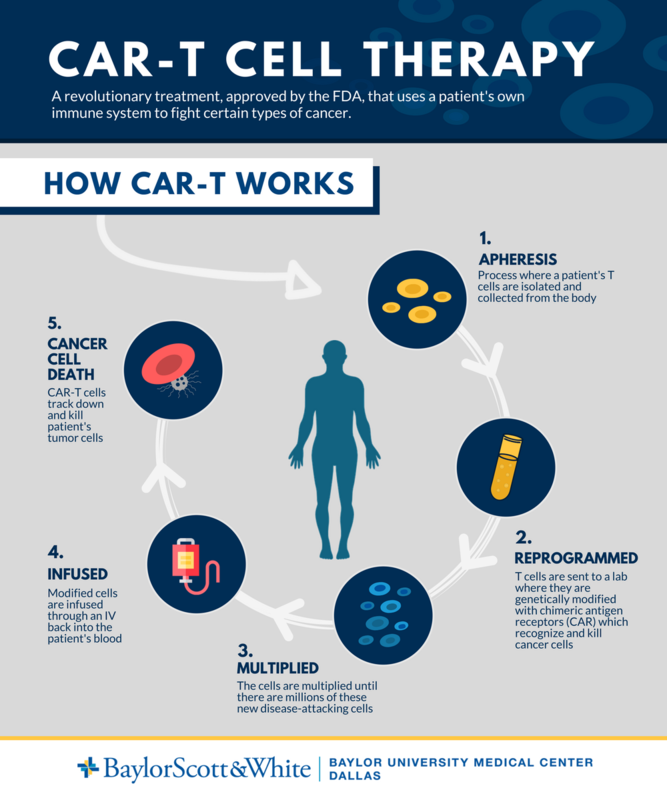 CAR-T (chimeric antigen receptor T cell) therapy is a personalized therapy for hematologic cancer in which a patient’s own immune cells are removed from the patient’s body, genetically reprogrammed, and infused back into the patient’s body to seek and destroy cancer cells. Large numbers of the CAR-T cells for each individual patient are cultivated in the laboratory and given to the patient in a one-time infusion. The process from collection to infusion could take up to one month. Apheresis: After a patient is evaluated and determined to be a candidate for the therapy, treatment begins with a collection of the patient’s white blood cells, or T cells. Reprogrammed & Multiplied: Once collected, the T cells are sent to a laboratory where they are modified with the chimeric antigen receptor protein that allows them to recognize the cancer tumor cells. The modified cells then go through a manufacturing process that can take a few weeks. Infusion: After millions of the CAR-T cells are manufactured, they are frozen and sent to Baylor University Medical Center where they are infused back into the patient’s blood stream. Cell Death: CAR-T cells then track down and kill the cancer tumor cells in the patient’s body. The FDA approval for this therapy is for use in adult patients with a diagnosis of primary mediastinal B cell lymphoma, high grade B cell lymphoma (DLBCL) arising from follicular lymphoma. It is for patients who have either not responded to, or relapsed after, two or more other types of cancer therapy. To refer a patient for CAR-T therapy at Baylor Dallas, please call 214.820.3535 to speak with a patient navigation specialist. A CAR-T clinical trial at Baylor Charles A. Sammons Cancer Center may be offered for other types of cancer, and can be found by calling a patient navigation specialist or searching our clinical trial database.